That is if it is nice out. Our Summers in Minnesota can be really hot and humid. Last week we had a few days in the 80’s and I think the humidity was in the upper 60’s. Its pretty bad when you wake up in the morning and there is moisture on your windows. This Sunday both of my boys (Nick and Andrew) and Nicks girlfriend Bree were over. I was out earlier and bought a fertilizer spreader for my rider. As I was assembling the spreader, Andrew was out mowing and weed whipping. Nick and Bree were kind enough (well we did pay them) to clean my 55 and 185 gallon fish aquariums. I love my aquariums and I think I have passed on the passion to Nick. 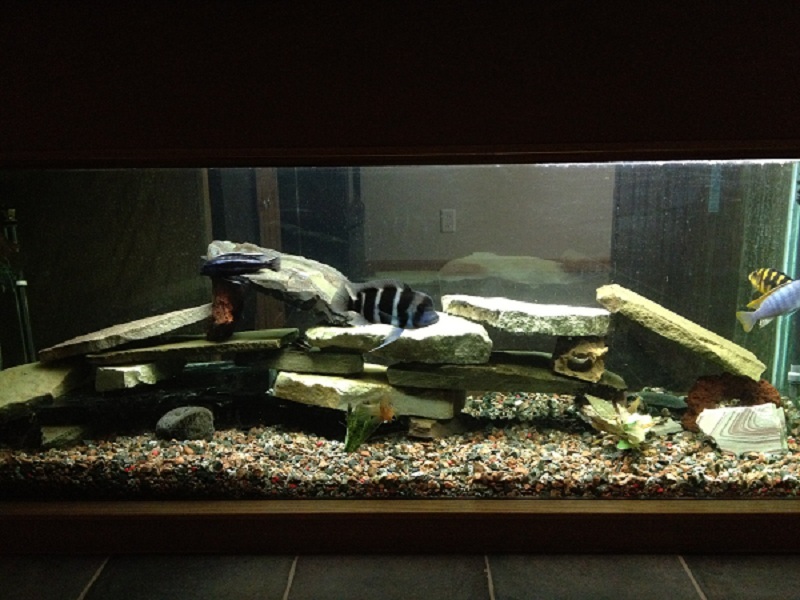 Nick has a 55 gallon aquarium too. While the four of us were doing our chores, Chris was busy in the kitchen working on home made pasta for a dish we were having tonight. We planned on grilling hamburgers, corn on the cob with the home made pasta. We finally got done with our chores around 4:30pm. Nick and Bree ran home quick to take a shower. Nick also had an Oscar with an attitude he wanted me to have. I was game as most of my fish were gone in my 55 gallon. 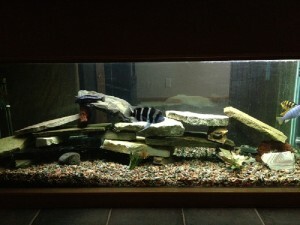 My 185 gallon has African Cichlid’s who would not welcome the Oscar with an attitude. Chris has the grill fired up earlier and was baking the home made pasta. She was just about ready to start cooking the corn and hamburgers when I knew it was time to have a glass of wine. I wandered down to our cellar looking for tonight’s beverage. I was not feeling like having a Cabernet Sauvignon or even a Pinot Noir. I had a feeling it was going to be a Merlot night again. I decided to grab a bottle of 2008 Pine Ridge Merlot from the Carneros AVA. Since Chris recently headed out to the grill I quickly pulled the foil and pulled the cork. As usual the cork gave me that great sounding pop! I quickly grabbed my tasting sheet, poured some wine and headed out back where Chris was grilling. 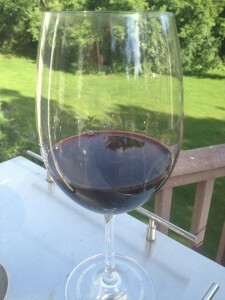 A glass of wine while grilling, nice! By the time I headed out, a third of the deck was covered in shade. There was a slight breeze so it felt pretty good outside. As Chris was grilling I decided to take some notes of the 2008 Merlot from Carneros. 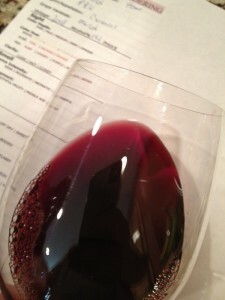 Inspecting the 2008 Pine Ridge Merlot the color depth in the glass was nice. Again, there was no sediment which I like. The color of the Merlot was Garnet and it was pretty clear. We decided to give the Merlot a sniff. The aroma intensity was nice, it was not to aromatic. The Merlot smelled young. We could smell Bilberry or maybe Blueberry, Red Cherry and maybe Fig? The smells were making my mouth salivate. We could not wait anymore and gave it a sip. The Merlot was medium bodied and the acidity was good. the tannins were medium and soft. The tannins were felt in the middle and worked towards the back of my tongue. The finish was medium and we could taste Cherry and Vanilla. The 2008 Pine Ridge Merlot was very nice. I know I have said this before. But, I can almost always tell a Pine Ridge wine. We finished grilling and all had dinner together. The kids stuck around for awhile and then heading out for the night. The day and night was excellent. If you were wondering about the aquariums they turned out great. Our 185 gallon tank in the basement bar. 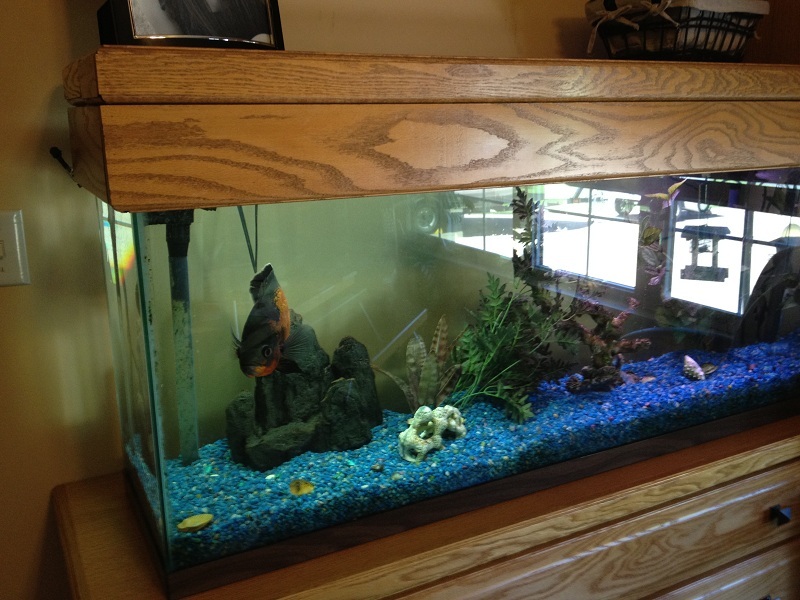 The 55 gallon tank with the Oscar with an attitude in our office. Chris and I ended the night with another glass of wine and finished the bottle. 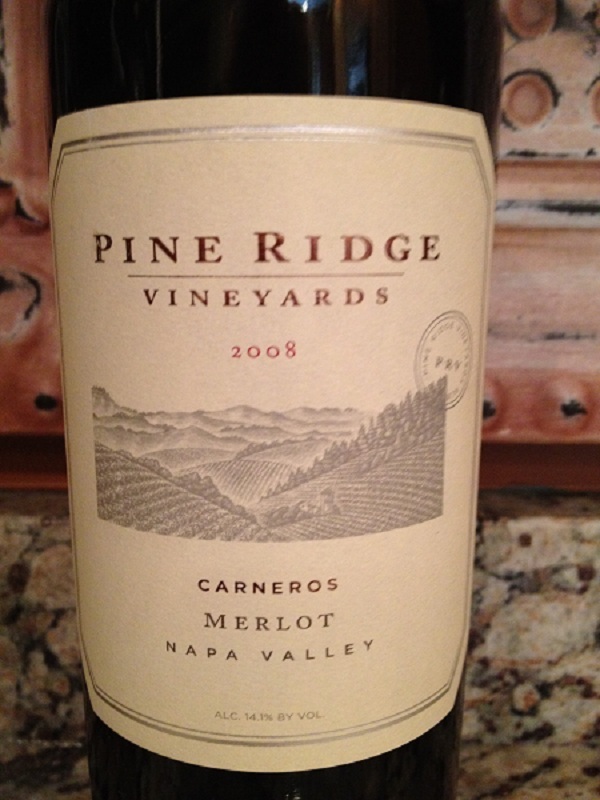 We both rated the 2008 Pine Ridge Merlot three glasses.